In July, USGBC® and GBCI®, in partnership with Urban Ingenuity, hosted a workshop in Washington, D.C., to discuss the future of microgrids in the District. As part of the all-day event, Urban Ingenuity and GBCI demonstrated two complementary approaches to assessing potential project sites. Together, they presented a case study describing the strengths, weaknesses and potential expansion opportunities for the microgrid at Gallaudet University, the world’s only higher education institution for deaf and hard-of-hearing students. GBCI’s portion of the case study included high-level energy and cost modeling and design optimization for several microgrid design scenarios, resulting in preliminary cost and savings estimations. After narrowing the options to a single design proposal, GBCI presented a sustainability assessment showing the resulting project’s potential performance when compared to the PEER™ rating system. Gallaudet University is a 6.5 MW microgrid serving 2.6 million square feet of space in Northeast Washington, D.C. The central plant boilers and chillers provide steam, chilled water and electricity to the campus. The university participates in a demand response program for 1.4 MW and has expressed interest in building additional solar PV capabilities. Gallaudet owns and is adjacent to several parcels of land that will be developed in partnership with JBG to add 1.5 million square feet of mixed-use building space. Gallaudet plus the new development would have a peak demand of 9.3 MW and an annual demand of 53,000 MWh. Over the next 10 years, an additional 8.5 million square feet of development is expected in the area. Position itself as a key resource by providing local, centralized power for the planned development. 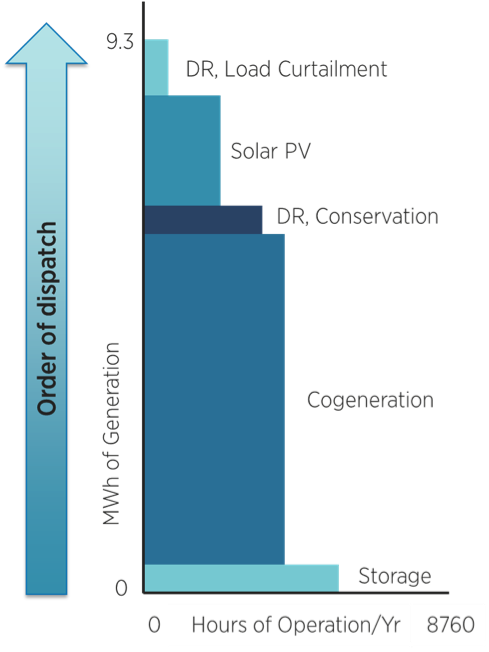 This package expands the cogeneration, demand response, solar PV production and energy storage capabilities of the existing microgrid (see below). With the proposed design, Gallaudet could meet all of the project demand using local generation for nearly half the year. The remaining demand would be met with a grid-purchased power contract that includes wind and solar. Based on the initial analysis, the team found that the total cost would be around $16.5 million and savings would be about $3.4 million, resulting in a simple payback period of only 4.8 years. At the same time, this package would result in a 50 percent reduction in source energy intensity, a 46 percent reduction in CO2 emissions intensity and a 59 percent reduction in water use intensity for each MWh consumed. Several of the other designs modeled by the team had slightly better payback periods, but the difference was measured in months. At the same time, the other designs performed worse across environmental metrics and resulted in less diverse mixes of energy sources. This illustrates how using tools like PEER to take a comprehensive look at the value and benefits of a microgrid—including environment, reliability and risk considerations—can lead projects to better outcomes with no or little increase in the simple payback. With these improvements, Gallaudet would be in a good position to pursue PEER certification. The project would likely meet the prerequisites and minimum point requirements in the Energy Efficiency and Environment credit category. For the other categories, only small improvements—such as formalizing programs, processes and policies—would be needed before the project was ready to submit for certification. Build a business case for microgrid improvements. Interested in using the PEER framework to explore the potential of your own project? You can get a comprehensive assessment of your project performance or a third-party estimate of your project value. Contact us to get started on your own screening today. For more information about the PEER rating system, see the credit library.